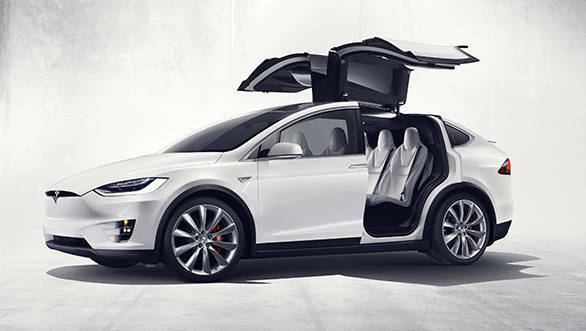 Tesla revealed the production version Model X at their Freemont plant in California, US on September 30, 2015. The world's first all-electric SUV was showcased at Tesla's design studio in Los Angeles as a concept model, back in 2012. 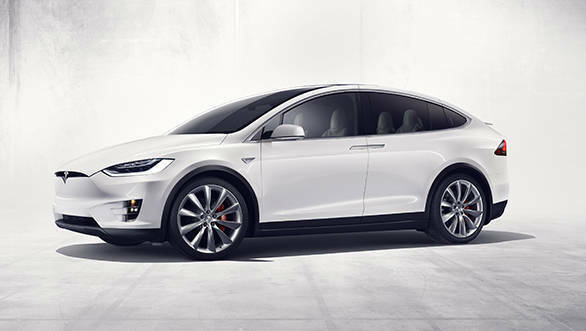 The design of the Model X is based on Tesla's flagship car, the Model S sedan. It even carries the same powertrain. It will be available in three variants, namely the P70D, P85D and P90D where the 'P' stands for performance, the two-digit number for the battery pack rating in kW/h (for example, P70D gets a 70kW/h battery pack) and 'D' for Dual motor. The combined power produced is 761.4PS and torque clocks in at 985Nm and the car can do a 0-100kmph sprint in just 3.2 seconds, according to Tesla. Tesla, of course, aren't satisfied with the regular modes like Comfort or Sport. They've equipped the Tesla Model X with this mode they call 'Ludicrous', where the car can go up to 250kmph - that's as fast as the Porsche 911 Turbo, making the Model X the second fastest SUV in the market, after the Bentley Bentayga (which clocks a top speed of 301kmph). Tesla also claim that the Model X can be driven for 400km in between charging stops. The looks of the Model X are very similar to the Model S. The similarities extend to the interior too with the same 17-inch touchscreen infotainment system making an appearance in the SUV. It's also a seven-seater with a third row of seats. We're rather besotted with the Falcon Wing rear doors which open to the second and third row of seats in the car. They're not just there for aesthetic value - the doors get sensors which allow the hinge in the middle of the roof to alter the angles and extent to which these doors can be opened. Then there's that massive windshield - the largest seen in any production car. From the outside, it looks no different from a regular windshield. But it's when you're inside the cabin that you realise it extends all the way to the middle of the roof, giving first and second row passengers a clear view of the sky. Aiming at a 5-star rating in the safety tests, Tesla have equipped the Model X with emergency braking and side collision sensors. It also gets radar and sonar sensors at the front. Prices start at less than $100,000 (that's roughly Rs 65.54 lakh) for the P70D variant and go up to $140,000 (Rs 91.75 lakh) for the P90D. This puts the Tesla Model X in the same price segment as other high end luxury SUVs in the market like the Mercedes-Benz ML-Class, Audi Q7 and the BMW X5.